We really really loved our Traeger Junior. We've had it a few years and it's been good to us. We've cooked everything on it: baby back ribs, salmon, chicken, vegetables, blue cheese stuffed dates, bacon, oysters…you name it. Tiffani and Deke decided to join the Traeger family and got themselves one of the newest, most compact Traegers that recently came out, the Traeger PTG. 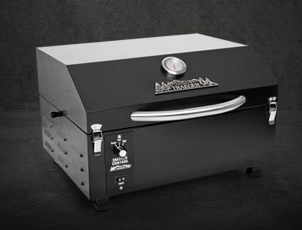 It's 13 inches high by 21 inches wide by 17 inches deep, weighs 40 lbs and has a 169 square inch grilling area. 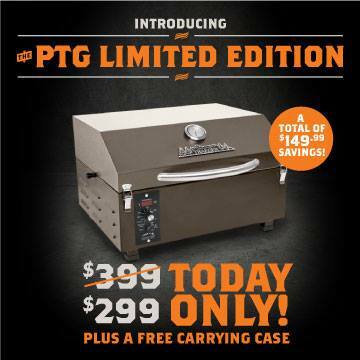 Highly portable (especially for a Traeger)! The Junior is 38 inches high by 36 inches wide by 16 inches deep, weighs 68 lbs and has a 292 square inch grilling area (basically, four racks of baby backs). It's so much more portable than the Junior (even after we took the legs off of it and added the tailgate kit to make it smaller) and we think we'll be able to cook almost everything we need to on this smaller grill. We seasoned it yesterday and tried it out last night (6 chicken breasts!) and so far, it's just perfect.